Santa's House Part 1: The House [W6818] - $10.00 : Yarn Tree, Your wholesale source for cross stitch supplies. Cross stitch pattern from Tiny Modernist. Ho, Ho, Ho, Merry Christmas! Welcome to "Santa's House." Strands of colorful Christmas lights decorate the rooftop with beautiful delicate snowflakes falling from the sky. The fireplace warms the house on a cold winter's day. Santa's sled awaits his arrival, filled with Christmas presents for all the good boys & girls. Getting ready for take-off, these reindeer are enjoying their dinner! 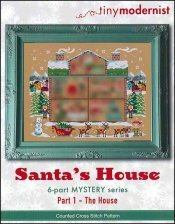 What do you think is happening in room 1 of "Santa's House?" Stay tuned! This is part 1 of the 6 part mystery series. Stitch count is 140h x 179w.